2015 Wills Ste.Claire Reunionites visit Stahls Foundation 80 Car Collection, St. Clair Shores, MI. 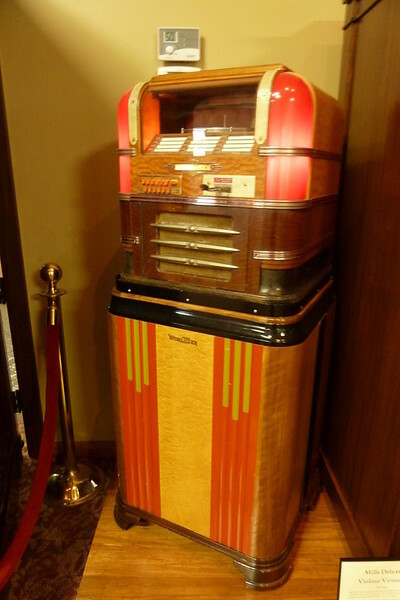 Look at all of these classy Juke Boxes and Musical Furniture that we saw in the lobby of Stahls Foundatiion 80 Car collection in St. Clair Shores - like WOW. And, then you go into this fabulous huge room filled with automobiles of every type, a Big Boy Restaurant from times past and an incredible organ that was being played by a professional. This was another treat for our Saturday before our gala event dinner at the Wills Sainte Claire Automobile Museum. Just look at these pictures and drool. Now, you have to admit that we had a fabulous day starting in Marysville, going to Detroit and then to St. Clair Shores and then back to our Museum for dinner. Please enjoy the pictures and when you get time, please stop by and see this museum.